Dear colleagues, we would like to invite you to take part at the 6th Central European Conference on „Engines of regional and urban development“ on September 20. – September 22. 2017 in Banská Bystrica, in Slovakia. Keynote speakers Prof. Peter Nijkamp, Tinbergen Institute Amsterdam, Assoc. prof. John Östh, University of Uppsala, Sweden, Prof. Daniela L. Constantin, Academy of Economic Studies of Bucharest, Romania. More are coming soon! Stephan Brunow from Institute for Employment Research (IAB) in Germany will organize a methodological workshop on Estimating models using firm-level data. We have scheduled the workshop on Thursday morning during 9,00 to 12,00. You can find more information on Stephan and his work below. We are thrilled to announce that professor Ugo Fratesi from the Department of Architecture, Built Environment and Construction Engineering at Politecnico di Milano will be our keynote speaker at the 7th Slovak Winter Seminar of Regional Science! Find out more about him and his keynote lecture Theoretical and empirical issues in the impact assessment of European Cohesion policy: the importance of territorial context below. As we informed earlier, the 7th Winter Seminar of Regional Science will take place in the mountain resort of High Tatras on 15th -18th March 2017 in the Hotel Slovan in Tatranská Lomnica (GPS: 49.1681 N, 20.2745 E). Accommodation costs will be covered by the participants. We offer you the possibility of staying at the seminars venue accommodation facilities. Please make your reservation AS SOON AS POSSIBLE at the Hotel Slovan (www.hotelslovan.sk) and let the hotel staff know that you are an “ERSA Winter Seminar” participant. Seminar participants have a special accommodation price in pre-booked rooms. Please, do not forget to book your breakfast. We have the pleasure of inviting you to the 7th Slovak Winter Seminar of Regional Science that will take place in the mountain resort of High Tatras on 15th – 18th March, 2017. The main objective of the annual Winter Seminar is to bring creative academic debate on actual issues of regional science and practice of regional policy by an attractive environment and relaxed atmosphere. 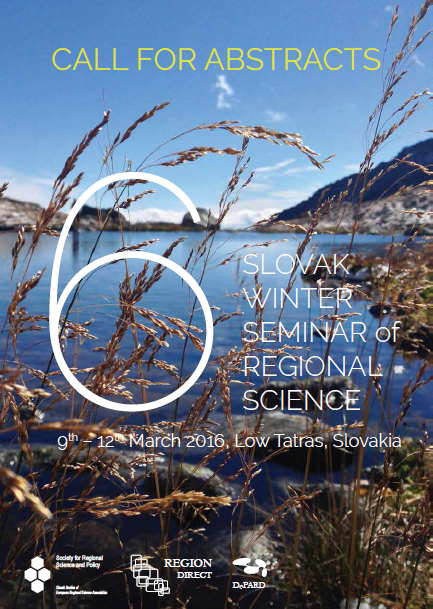 We have the pleasure of inviting you to the 6th Slovak Winter Seminar of Regional Science that will take place in the mountain resort of Low Tatras on 9th – 12th March 2016. The main objective of the annual Winter Seminar is to bring creative academic debate on actual issues of regional science and practice of regional policy by an attractive environment and relaxed atmosphere. Accepted articles will be published in the conference proceedings "6th Slovak Winter Seminar of Regional Science 2016” with ISBN. 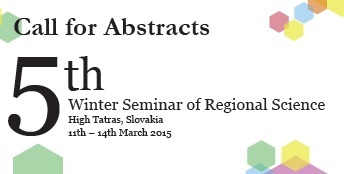 Selected papers will be invited to publish in the peer reviewed journal Region Direct in 2016. The workshop is organized with the support of the Foundation of Bank VÚB (Intesa Sanpaolo Group), Department of Public Administration and Regional Development and the Slovak Section of European Regional Science Association within the project eVALU8. The main objective of this workshop is to bring together experts on cohesion policy evaluation from the academic sphere and political practice. It is my great pleasure to be writing this short personal reflection of the 5th ERSA Winter Seminar of Regional Science which took place from 11th to 14th March 2015. Since this was my first Winter Seminar ever, I really had not known before what to expect. Of course, being a social scientist, I carried out vigorous investigation and both quantitative and qualitative analysis prior to the event. This was to be later compared with my personal observation and collection of data. All people from the representative sample whom I asked to comment and reveal some intriguing facts about the seminar said that it is a rather smaller but nevertheless an interesting event with a cosy atmosphere in the field of regional science. Even the official mission statement said that the main objective is to bring creative academic debate on current issues of regional science and practice of regional policy in an attractive environment and relaxed atmosphere. So let me briefly go over the event and provide some hard evidence to either confirm or refute this rather challenging hypothesis. Finally we have 18 papers and a key note lecture by professor Christoph Weiss (WU Wien) on Information and Price Dispersion in Space: Theory and Evidence. In addition we will have several joint leisure time activities and a gala diner in the end. Please find the program below.